I actually first learnt of this product from my mother, who had already been using it for quite a long time. Unfortunately I have no idea of how she came across it, but I'll tell you my story. Being a dancer, I had to learn how to do my own makeup from a very young age, stage makeup unlike street makeup, has to be very big, and bright. For example, during my year end recitals I was always required to wear white eyeliner on my bottom lash line, and black underneath that, making my eyes look humongous. Also, did you know that dancers can't wear pink lipstick on stage because from the back of the audience, pink lips look blue! Therefore we always had to find the best brick-red lipstick out there, in order to look human. One time, we were doing a performance downtown in a place without dressing rooms, and due to the limited amount of parking spaces, many of us had to bus, well one of my friends and her sister bussed carrying their costumes and wearing full stage makeup, and the other passengers were looking at their mother like she was crazy! Anyways, what I'm eventually going to get to, is the fact that I needed a very good makeup remover that would be able to get everything off, and wouldn't leave diluted smudges of colour all over my face. The first few that I tried didn't work very well, and were especially bad at getting lipstick off, they often left my lips and the area around them pink, which didn't really work for me if I was trying to remove a smudge. The more I danced, the more often I had to use them, and soon I developed an allergic reaction to them. 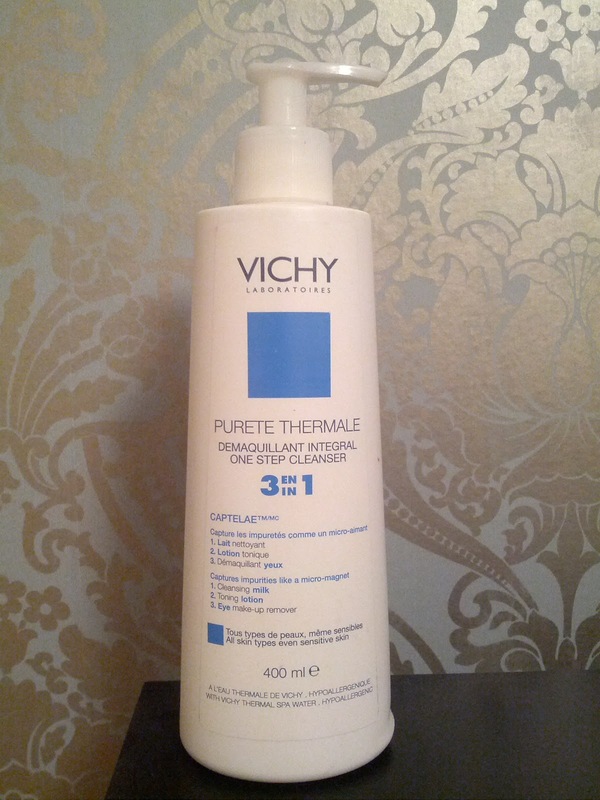 That was when my mother told me to try the VICHY Purete Thermale 3 in 1 One Step Cleanser. It's 3 in 1 because it is a cleanser, eye makeup remover, and toner all in one, and is perfect for sensitive and dry skin. I found that PT was perfect for my skin, it didn't irritate it once! PT also has a very nice creamy consistency, it isn't oily, but probably milky instead. The smell too, is very neutral and refreshing. Some makeup removers leave me feeling like I dunked my face into something and can't wash it off afterwards, while others are like rubbing yourself with oily chicken. This one is definitely like neither of those horrid examples! The most important aspect of a makeup remover is obviously how it removes makeup, PT is wonderful at getting layers of it off, and usually doesn't leave any where other products would leave a lot. I also found some of the ingredients in the product very interesting, this is what the VICHY website says about them, "Captelae™, a Shea plant extract, which works like a micro-magnet to remove impurities from the skin. With Vichy Thermal Water, clinically proven to soothe and fortify skin. Also with vitamin B5 for its moisturising properties. Lightweight non-greasy fluid. No rinsing required." I agree 100% with the non-greasy fluid and no rinsing required part, it leaves your skin feeling great. All in all, I would definitely recommend this product to all of you, and I can freely say that this is the best makeup remover out of all those that I have tried! Hi darlin! Just found your blog and am your newest follower on GFC #24! Check out my blog if you'd like! Thanks:)! Very interesting and informative! I am very fond of make up and this 3 in 1 One Step Cleanser is the perfect make up remover for me. That's great! I want it to be helpful! good to know! thanks for stopping by and of course we can follow each other, following now! He probado varias cosas de esta marca, pero este producto no lo había probado. You should try this one then! It's great! nice blog babe, wanna follow each other? just follow me on GFC and then I will follow back for sure! lo he probado, y me encanta! I follow you but I can't see you in my followers list!!! That's really interesting how pink lipstick is seen blue for people in the back. And great review, I think I'll try to find it. I've been looking for a good cleanser! What is the price range for this one? & thanks for the nice comment on our blog! The hurricane wasn't as bad as down in New York. It was just crazy windy haha. I honestly have no idea why the lipstick colour changes that way, it just does! As for the price range, I can't tell you exactly, because I purchased an oversized bottle, but I'd estimate around $20-$35. Thank goodness Sandy didn't affect you too much! btw i find your blog amazing :) so i'm following you now :) mind following back? :) thanks a bunch!!! Thanks for stopping by my blog and leaving a sweet comment! Let me know if you would like to follow each other via GFC?? I'm using some products from Vichy and I love them all. Never tried this one, but I surely will! Wow, I really didn't know your lips would look blue from far away lol!! I love your review !! Helpful post and great blog.